...And Jennifer Aniston off it, in Sukanya Verma's super filmi week! This week I woke up to tragic world news with frightening frequency, got trolled by a bunch of humourless Hrithik fans too fixated to realise these are precisely the reasons to get excited about the movie and fell sick for the third time in quick succession. Monday blues meet men in blue as I sit down to watch a movie based on a famous cricketer’s journey from success to scandal. Funny how the subject of its inspiration and title -- Mohammad Azharuddin -- gamely joins the cast and crew during promotion but its disclaimer goes on about how it’s not exactly a biopic. How did I find it? Let’s say, the sight of a losing Indian team isn’t as painful as the embarrassingly boring Azhar. That it’s so blatant in redeeming its controversy-ridden hero isn’t as shocking as how poorly acted and sloppily written it is. Every few days, a Sultan-themed trending topic pops up to stress on Salman Khan’s unshakeable stardom. Seeing a brand new one on my homepage activates my inner Mungerilal. 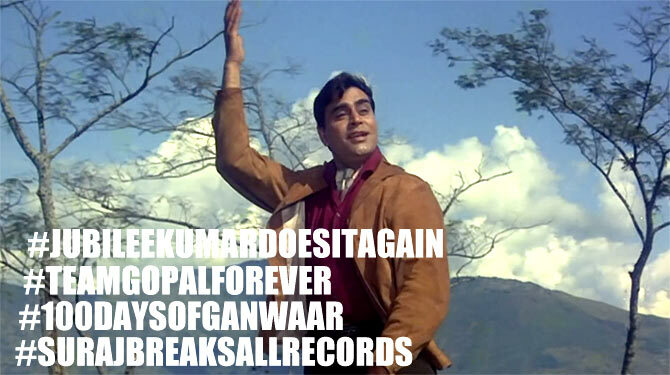 Imagine if we had Twitter in the 1960s, yesteryear star Rajendra Kumar would be all over the place. Between early to mid-sixties, the Sangam hero scored six big hits in a row. In classic social networking tradition, our timelines would be flooded with Rajendra Kumar memes, dedicated fan clubs calling themselves Rajendra Kumar’s army, polls pitting Team Sundar against Team Gopal and his popularity hash tags would read something like this. Coming from a society where most people in your life and even more outside it make your marriage/parenthood or lack of it their greatest preoccupation, Jennifer Aniston's piece 'For The Record’ deeply resonates. I am a huge fan of her comic timing, low-key style and breezy wit but when the Friends star states, 'We don’t need to be married or mothers to be complete. We get to determine our own 'happily ever after' for ourselves,' she’s conveying a grievance that transcends celebrity and culture. This whole approach and conditioning towards personal fulfilment is regressive, unfair and alienating. Men and women have their own reasons to marry or have babies. And sometimes they don’t or wont. It’s nobody’s business but theirs, how about minding our own? If there’s one thing no movie buff can ever claim, it is ‘I’ve seen every single film in the world.’ There’s a staggering number out there waiting to be discovered and savoured (or loathed for that matter). All one can do is watch as many as possible in this lifetime. What I like to do is create a customised menu, a personal film festival of sorts, where I pick a filmmaker and his three creations and watch them within a set time frame. One month, it was the remarkably perceptive Japanese filmmaker Hirokazu Koreeda’s Still Walking, Like Father Like Son and Nobody Knows. Next, I focused on indie master Jim Jarmusch’s Broken Flowers, Night on Earth and Ghost Dog: The Way of the Samurai and his spectacular ear for soundtrack. And now with The Pied Piper, a dark, political take on what’s perceived as a children’s tale by Brothers Grimm, I complete my Jacques Demy trilogy following The Umbrellas of Cherbourg and Donkey Skin. How can one not be wowed by the visual palette, wryness and whimsy of his stylised filmmaking? It’s not a patch on Baba Ramdev’s twisted pose for the India Today cover but Meenakshi Seshadri and Jaya Prada’s freestyle yoga moves in Hoshiyar doesn’t fall short of trying. Heck, it’s not even flying. 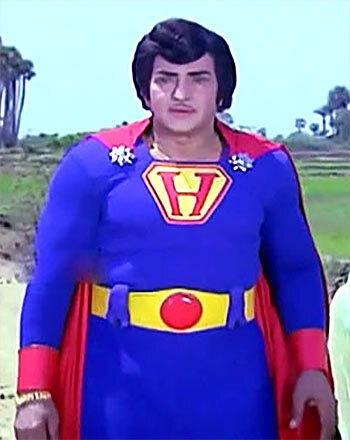 I don’t know if it’s the antibiotics I took for my flu but I think I just saw N T Rama Rao in Superman’s costume. And, whoa, he just pulled out a bullet from his chest as if it was chewing gum stuck to a desk. The logo reads H not S as a mark of appreciation to Lord Hanuman, who bestowed him with superpowers to avenge his family’s murder. 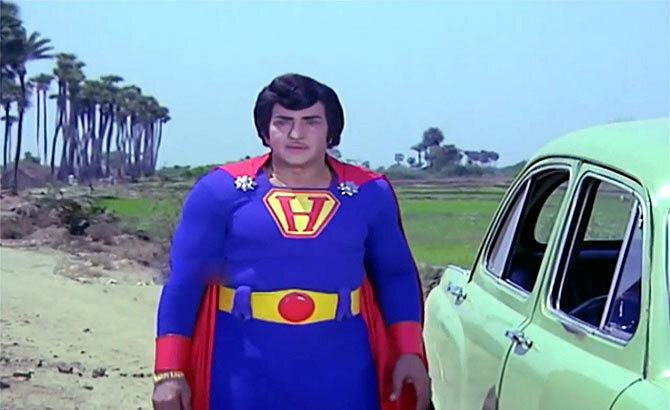 P:S: Not only can he fly but also waltz mid-air with, what do you know, Jaya Prada in tow. Among Facebook’s many features, one is to dig up old posts and feed off our nostalgia. This once, I don’t mind. The said entry is a picture of Amjad Khan in Lawaaris and my caption reads: His ferocity is iconic but look how well he conveys guilt in this scene from Laawaris. One feels sorry for him. In the Prakash Mehra drama, Khan dumps Rakhee as soon as he learns about her pregnancy to marry a wealthy heiress. As time goes by, he’s filled with regret over his past actions, all the more after meeting his illegitimate son who’s grown up to be Amitabh Bachchan. The shame he feels on watching Bachchan’s Mere Angne Mein dance (and not because he’s dressed in a ghagra choli :-P) evoking memories of Rakhee and her version of the same, is a poignant moment in an otherwise kitschy melodrama. As Sholay’s Gabbar Singh, he hits the peak of menace but it’s important to recognise his incredible range and quality across a variety of genres in films like Chameli Ki Shaadi, Qurbaani, Yaarana, Meera, Shatranj Ke Khiladi, Muqaddar Ka Sikandar, Lekin, Pataal Bhairavi and, of course, Laawaris. Udta Punjab, worst casting decisions, and naheeee...!